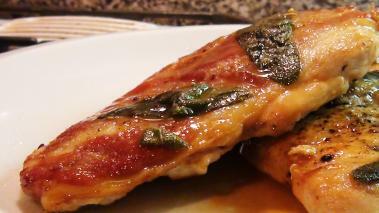 Saltimbocca, in Italian, means "jumps in the mouth", and after tasting this chicken saltimbocca you'll understand why. Traditionally, the recipe is made with veal, but because chicken is easier to get and a bit healthier, I usually make it using boneless skinless chicken breasts. Each piece of chicken is covered with a thin layer of prosciutto ham, and some sage leaves before being seared in the pan. I think make a simple, lemon sauce, that adds some acidity and brightness to the dish. It's one of my favorites and I think you'll love it! Plate up the saltimbocca with a bit of the sauce spooned over the top and enjoy! While in all cases, I say drink the wine you like best, I think a Pinot Grigio would go really well with chicken saltimbocca. The white wine has a good amount of acid, making it food friendly, and the citrus notes will offer a nice counter point to the salty prosciutto and savory sage leaves – not too mention the slightly lemony sauce. Hope you enjoy it! Our most popular recipes in our most popular foods. Our best pasta recipes & techniques will have you cooking like an Italian Grandma. Tired of dull, dry pork? So are we! Learn how to make the best chops on the block. Plated or Blue Apron: Which one is the Healthiest Choice? Everybody eats. And at some point most of us cook...at least something. But when I talk with amateur chefs the conversations too often go right to what to cook, without spending anytime on how to cook. For me cooking, is about technique. Sure, recipes are great, but they don't make great food: People do. My goal is to teach and show people how to cook, so they can take any set of ingredients and make something special. © 2019 NoRecipeRequired ~ All Rights Reserved.